Pythagoras supposedly condemned the eating of meat, which shared with animal sacrifice the immoral stain of bloodshed. The Jains of India go further: for them, all eating is violent—plants are also living—and sallekhana, or fasting to death, is the noblest path. Violence is not the only ethical concern that has occurred to people worried about eating: Zoroastrians were forbidden to eat food prepared by nonbelievers because of its moral pollution, and probably many of the dietary restrictions of the Old Testament can be interpreted in a similar way. Some moral compulsions about eating are so specific to cultural conditions that they are nearly impossible for outsiders to interpret at all: some ancient peoples of India considered it taboo to eat chicken, while many Indians and Nepalese today will not eat beef. Given the near ubiquity about these worries about food, Filipinos, especially Kapampangans, can seem like a joyously liberated lot. The Kapampangans delight in every bit of the pig’s body, eating not only its flanks and limbs, but also its face and intestines (sinsal). They seem to eat nearly everything. Stuffed frogs and fried crickets are popular with them as well. While I lack the conviction to be a vegetarian, I do not quite enjoy the gustatory free-spiritedness of the Filipino. I generally avoid pork, since pigs seem to be extraordinarily sensitive, afraid of death, and intelligent. 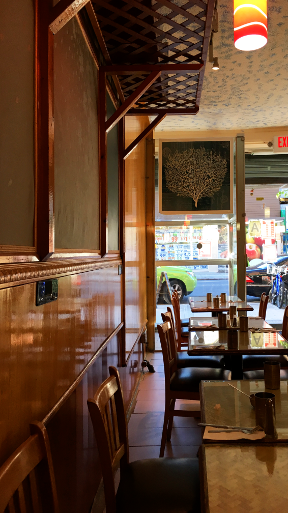 When a reviewer on Yelp (who may have been Filipino, it must be noted) enjoined readers not to order any of the pork dishes at Renee’s Kitchenette “because pigs are friends, not food,” I was chastened for thinking of ordering a pork dish. Thus, before my trip to Renee’s Kitchenette, another restaurant with a strong selection of Kapampangan dishes, I diligently researched less troubling alternatives, settling eventually on a seafood version of kare-kare. 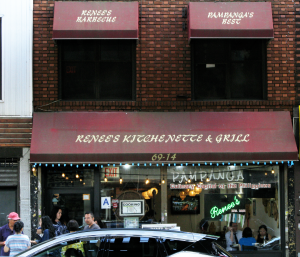 Renee’s Kitchenette may be the oldest Filipino establishment in what has become known as “Little Manila” (the stretch of Roosevelt Avenue from roughly 68th to 70th Street), having opened in the early 1990s. It is in the middle of a block bracketed on one by Philippine National Bank and on the other by Krystal’s Café & Pastry Shop, another venerable institution in the Philippine culinary scene. 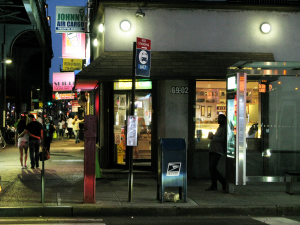 On the sidewalk between Renee’s Kitchenette and Krystal’s Café there is a small stand with a Styrofoam box covered in signs advertising balut. I would have my encounter with balut before the end of the evening, but more on that later. The interior of Renee’s is festive, with party-themed bric-a-brac hung around the bar and bright posters advertising deserts hung around the dining area. 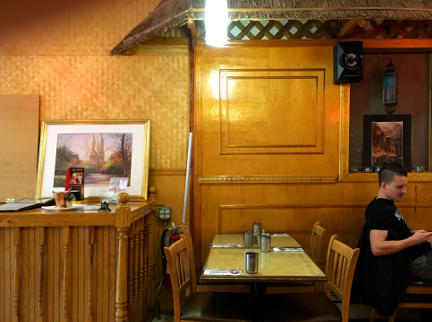 I had read that Renee’s is relatively quiet, having lost the big crowds to its upstart neighbors—but it was packed when I was there, the whole place buzzing with tagalog and tagalog-inflected English. When I ordered the seafood kare-kare, the waiter smiled approvingly. “Very good dish,” he said. “It comes with shrimp paste!” Naturally, I made him promise the shrimp paste would be safely on the side. 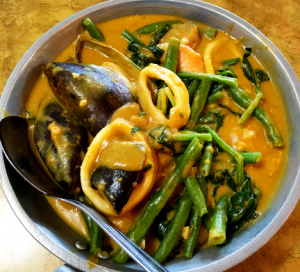 The kare-kare, like the oxtail kare-kare I had last week, came in a deep bowl, filled with squid, mussels, shrimp, eggplants, and spears of vegetables submerged in thick peanut sauce. Like the oxtail kare-kare, it was less spicy than you might expect, but very good. The seafood contributed more flavor than the oxtail, making this the more successful dish. Since the bagoong (shrimp paste) was there, I tried it again. It may be that all but the simplest tastes are perversions of natural good judgment, acquired through lifetimes of strange culinary accidents. In any case, it is possible to find something to appreciate in the putrefaction of shrimp. Once I became used to the taste, its grip on my tongue made me think of the pleasing toxicity of tobacco or good scotch. Having conquered, or been conquered by, bagoong, the next step was naturally to try balut. This is a little different, of course. Balut, fertilized duck egg, comes fraught with ethical concerns. Was the embryo conscious when it was killed? How was it killed? I did my research beforehand and learned that it is after the 18th day that the embryo has an adequate nervous system to feel pain when it is boiled to death. Yelp reviews of “the balut guy,” as the owner of the cart with balut is known suggest that if you’re averse to a beak and feathers in your egg, you can just ask for balut that is less than 18 days old. So that was what I did, counting on skirting ethical concerns. 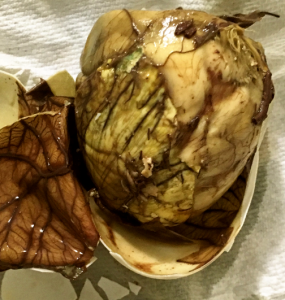 My heart dropped when I opened the balut. At a glance, there was no obvious sign of a well-developed chick, but somehow I had stumbled across an inner taboo I had not known existed. Nevertheless, the balut had been purchased, so I bit into it. I encountered a combination of tender meat and amazingly tough egg yolk. My heart kept sinking as I discovered rather well developed chick. I highly doubt the egg was less than 18 days old. But I also do not know if the Muslims are correct to judge that boiling an unhatched fertile egg is cruel, at any stage. Who can say? 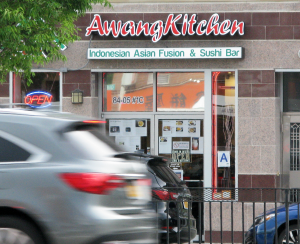 Tucked in next to a FedEx in a corporate-looking, granite-fronted building on Queens Boulevard, Awang Kitchen does not look promising from the outside. I have walked by it without noticing it more than once. The staff seem aware of this. One of the waiters asked me how I found out about it. Awang doesn’t lack customers. It was quite busy when I went, and I had to wait for a table. But all of the customers seemed to be Indonesian, and I would guess they all learned about Awang Kitchen from friends. 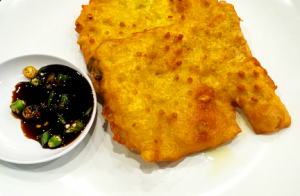 Those sincerely interested in Indonesian food might also be wary of Awang Kitchen’s description of its food as “Indonesian Asian Fusion Japanese.” Indeed, the space inside is dominated by a sushi bar. But the television above the sushi bar is tuned to BeritaSatu, an Indonesian station dedicated to news analysis, and most of the conversation around me sounded Indonesian. In fact, I suspect this kind of Asian Fusion is common in Indonesia’s bigger cities, and the restaurant would not look out of place in Jakarta. The menu is lengthy and byzantine. When the waiter handed me a copy, he asked if I had ever eaten Indonesian before, ready to offer instruction. (He beamed and thanked me for the compliment when I told him I had enjoyed the food at his competitor, Upi Jaya—apparently national pride outweighs professional rivalry here.) I had come specifically for Javanese food, since the cook is from Jakarta, so I looked for a few Javanese dishes I had read about. 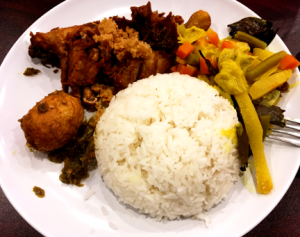 For a first taste of Indonesian food, though, it might be better to pick spicier Sumatran food, which is probably the most popular and accessible food of Indonesia. 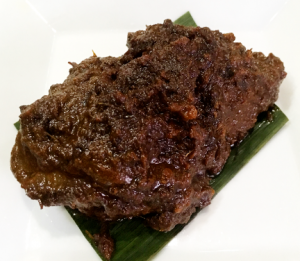 Reviewers on Yelp consistently praise Awang Kitchen’s beef rendang (a Sumatran dish). My meal began with tempeh mendoan. Tempeh is probably familiar to most readers. When I was in college, it seemed that everyone with hair of a certain length ate tempeh. I was not aware, however, that it originated in Indonesia. Like bagoong, tempeh is the result of fermentation (fermented soybeans). But unlike bagoong, tempeh is fermented by fungi, not bacteria. Tempeh mendoan is a dish from Java. It is tempeh sliced thin, battered in dough, and partially fried. It is raw in the middle. Awang Kitchen serves it with thick soy sauce with sliced chili peppers. It was absolutely delicious. Next was ayam goring kalasan. This is another dish from Java—fried chicken marinated in coconut water. That is what was listed on the menu, at least—but chicken was only one of several items on the plate. In the center was a great globe of basmati rice, around which were arranged: an egg marinated in spices and apparently boiled and fried; a mixture of vegetables boiled in turmeric and other mellow spices; and the chicken. On the side, my waiter placed a chili pepper paste that was extremely hot. The chicken was actually a little disappointing. It tasted much like fried chicken at any American restaurant, though the meat was not as ridiculously plump as the chicken meat at, say, Popeye’s. But the egg and the vegetables were quite good. 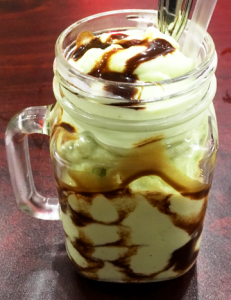 Finally, jus alpukat: “Blended avocado, sugar, condensed milk, and ice.” It was just as good as it sounds! Too late, I noticed that they also have jus durian—a durian milkshake! The dessert list also includes es teler (avocado, coconut, basil seeds, jackfruit, sugar palm fruit, grass jelly, milk, and ice), es cincau kelapa (cocopandan syrup, grass jelly, coconut meat, and milk), and es the lychee (black tea with lychee, sugar syrup, and ice)—among quite a few others. When you pulverize shrimp, put it in salty water, and store it in an earthen jar, a variety of bacteria begin breaking the starches down into sugars and converting the sugars into lactate. The process is commonly called fermentation—though most people’s favorite kind of fermentation is carried out by yeast rather than bacteria. Other bacteria break down the proteins into simple amino acids. Eventually, the jar contains a substance that very little resembles the original shrimp. In the Philippines, they call it bagoong. Tonight at a Filipino restaurant known for its Kapampangan cuisine, I ordered kare-kare, a Kapampangan dish made with peanut sauce, which is supposed to be similar to Indonesian satay. It looked magnificent when it came to my table, a deep bowl filled with thick peanut sauce, slices of eggplant, and hunks of ox tail. I was just about to begin eating when the waitress exclaimed. I dutifully waited. Another waitress had just finished setting up a table for a “boodle fight.” She had first covered it completely with banana leaves. Then she had spread rice over the banana leaves. Finally she had begun laying various edibles out on the rice. When I asked her to explain it to me, she said encouragingly, “anyone can try it. Actually, mostly foreigners do it.” Then she corrected herself: “non-Filipinos.” I am still trying to learn why it is called a fight. Finally, my waitress brought a little bowl filled with dark amber matter. “You’re all set,” she said brightly. Bagoong communicates with primitive parts of the brain before the taste buds have a chance to taste. The thought, “I have just eaten something rotten and may vomit” crossed my mind before I was aware of any flavor at all. However, when I realized that I was not, in fact, going to vomit, the flavors pounded a variety of taste buds that I had not known existed. There were high, rattling notes reminding me vaguely of horseradish, and there were low, unctuous notes, reminding me of castor oil. But in fact, the practice of pulverizing shrimp and fish and fermenting them to make a sauce is found throughout Southeast Asia, including Thailand, Malaysia, and Indonesia. Thais call it kapi; Malays, belachan; and Indonesians, terasi. It may have originated in 8th century Thailand, and over the centuries it has repelled a great number of visitors to Southeast Asia. It seems very much to be an acquired taste. 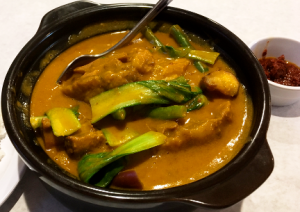 Fortunately I tried the kare-kare­ unflavored with fermented shrimp before the shrimp overwhelmed my senses. The peanut sauce was excellent. It was not quite as rich as the satay at Upi Jaya—but perhaps this was more appropriate for an ox tail soup. The ox tail was very soft, and the meat fell off the bone with a nudge. It was mild, much less spicy than its Indonesian cousin. The Kapampangan people live mostly in the southern part of Luzon. Their language is distinct from Tagalog, although it is another Austronesian language. The language once had its own script, Kulitan, and was spoken in the powerful kingdom Tondo. Before their defeat by the Spanish, the Kapampangan people were mostly Hindu or Buddhist, and traded with India and China. Their culture appears, however, to have been deeply imprinted by Spanish and Mexican influence (as the Philippines were directly administered from Mexico). You can hear it in some of their music. Supposedly much of their cuisine was similarly influenced by the Spanish and Mexicans, but kare-kare strikes me as purely Southeast Asian. A friend from South India once gave me a recipe for sambar, a dhal, or lentil, dish that is commonly eaten with dosas, idlis, or rice. 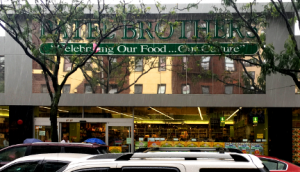 He had adapted the recipe to use mostly ingredients available in American grocery stores, though I still had to find a store with a large ethnic foods section for the tamarind (which is popular in Latin American cooking as well as Indian). His version used yams to add variety to the dhal. 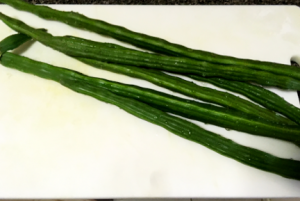 Now that I am in Queens and have the very large Indian grocer Patel Brothers near my house, though, I have attempted a recipe using instead drumsticks, which are large, somewhat intimidating bean pods. The recipe comes from Mangoes & Curry Leaves: Culinary Travels through the Great Subcontinent. Sambar is a relatively simple, forgiving dish, especially if you opt (as I do) for tamarind concentrate instead of laboriously preparing a tamarind extract from tamarind pods (as I used to do). You simply bring your dhal to a boil with turmeric and let it simmer until it becomes soupy. In the meantime, cook black mustard seeds, peppers, fenugreek seeds, and curry leaves in oil until the seeds pop. Then you add the tamarind and boil. Cut the drumsticks into less intimidating pieces and add them to the boiling liquid. Finally, you combine everything in a big pot and cook long enough to combine flavors. 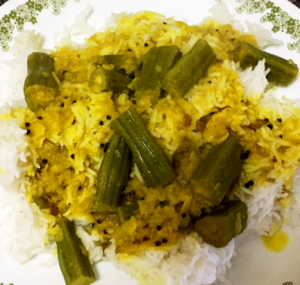 The result of the recipe in Mangoes & Curry Leaves was tasty, but very thin. The drumsticks were a revelation for me. One eats them like artichokes, and, surprisingly, they taste like artichokes! I am not sure, but possibly artichokes would be a cheaper alternative. The drumsticks seemed to have taken up the spices better than the dhal, so perhaps one needs to cook the combined ingredients for longer than the book’s recommendation of ten minutes. It seems to have been easier for me to get satisfactory results with yams, which gave the sambar substance and took up the spices wonderfully, but I don’t regret trying the drumsticks, which are very tasty. Some of the most colorful features of Indonesian culture were forged in Indonesia’s embrace of Indian influence. The famous wayang, shadow puppet shows, tell stories from the Mahabharata and Ramayana. The wonderfully loopy script you sometimes see Indonesians reading on the R train descends from Pallava script, an ancient Indian script based on Brahmi, from which Devanagari, the script used for Hindi and Nepali, also developed. But wayang and the loopy script are both native to Java. Islam, which would spread across Indonesia’s 17,000 islands, entered far to the west, in Sumatra. Like the peoples of Java, the Sumatrans speak an Austronesian language, but they never used an Indian script. Their language, Minangkabau, was first written in a script based on Arabic. Do you see Indonesians reading Minangkabau on the R train? I wouldn’t know. It is now usually written with the Roman alphabet, and it looks and sounds like Tagalog to me. 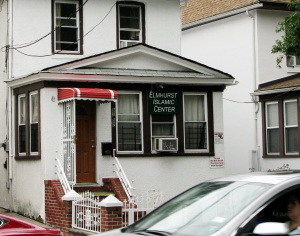 Today, Islam unites the islands, and I assume that most of the Indonesians living in Elmhurst pray at one of the modest Islamic centers here. But the regional differences of the homeland survive in Elmhurst—both in language and in food. 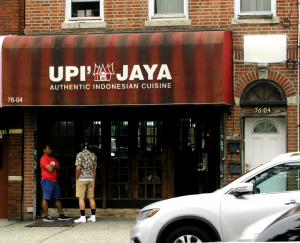 Upi Jaya, an Elmhurst restaurant where I ate tonight, is known for its Minangkabau cuisine, more commonly called padang cuisine for the capital of west Sumatra. I cannot contrast padang cuisine to the native dishes of Java or the other islands (I add native because Minang cuisine is supposedly popular throughout Indonesia. But what I had was extremely rich and pretty spicy. I ordered redang padang (spicy beef) and satay ayam (skewered chicken in peanut sauce). 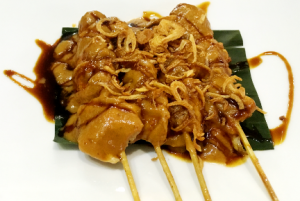 Surprisingly, Upi Jaya made better satay ayam—which is really a dish from Java—than redang padang. The redang padang combined biting and mellower spices for a wonderful taste, but the meat was dry and tough. The satay ayam, on the other hand, was soft, sweet, and spicy—delicious. The space at Upi Jaya is intimate, and there are no social boundaries between tables. A man who said he’d traveled two hours from New Jersey to eat there struck up a conversation with people at a neighboring table, and a little boy from another table brought me his father’s credit card (which, let me assure you, I returned to its owner). The walls of the restaurant are all covered with mirrors, and I imagine it can get loud when it is crowded. The service at Upi Jaya can be a little slow. If you have a little time, though, Upi Jaya is a good place to get acquainted with the food of Minangkabau—and Java. Despite their great numbers in the United States, Filipinos have not yet made a clear impression on the American mind at large, and even other Asian Americans may sometimes think they are somehow Latin American or Polynesian. The complexity of their identity no doubt confuses us: they are a people who often natively speak three very different languages (Tagalog, English, and Spanish), and may very well speak other Philippine languages in addition. 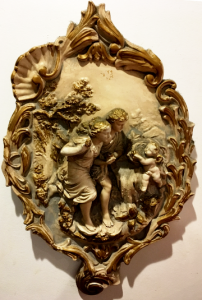 They are superbly open to foreign influences of all kinds, and have absorbed culture from China, Singapore, Thailand, and Spain and the United States. Of course, I know that even this is a simplification. Those 7,000 islands harbor a lot of diversity, and the “they” that we think of in the United States probably does not capture much of it. “They” were converted to Christianity in the days of Magellan, and have rejected most of the beliefs and practices of the pre-Christian era. Interestingly, though, the Ilongots of the mountains of Luzon, like many other peoples in the Austronesian sphere, practiced headhunting well into the twentieth century. 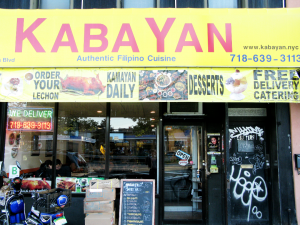 It is possible to taste a little of the diversity of the Philippines in Queens. 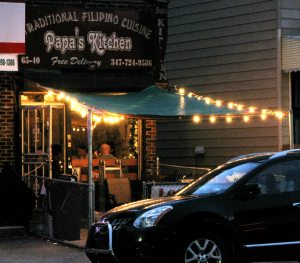 An immigrant from the Bicol Region, a group of islands southeast of Luzon, opened Papa’s Kitchen—a restaurant serving Bicol dishes—in Woodside a few years ago. I went tonight. Papa’s Kitchen is a tiny space with painted brick walls. A chalkboard menu hangs over the counter, lending the restaurant the ambience of a coffee shop. There are probably four tables on a regular night; tonight, two of them were pushed together to accommodate a large party of Filipina women out to celebrate a birthday. My meal was accompanied by a constant patter of conversation in Tagalog, English, and Spanish. I ordered Laing, which seemed to please the waiter immensely. 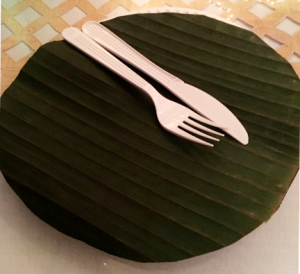 He soon came to my table beaming with a large banana leaf cut in a circle. Then he brought the Laing, a bowl of dark green vegetable matter. To be precise, Laing is made of taro leaves cooked in coconut milk with a little shrimp base, and spiced with hot chilies. I soon understood why the waiter was so pleased. He was soon agreeing with me that, yes, it really is quite good. It is spicy, rich, and creamy. It brings to mind Indian saag, but the coconut milk makes a pronounced contribution. The TV hanging over the entrance was tuned to America’s Got Talent when I came in. But before I left, they turned this show off and brought a microphone to the birthday girl for karaoke. She sang with surprising range and control. Talent indeed. National cuisines and tastes may, like languages, be difficult for foreigners to understand. The first time I had Philippine food I encountered this difficulty. I was given fried tilapia slathered in sweet and sour sauce. It was not bad, but I simply could not understand it: why would anyone put sweet and sour sauce on tilapia? The middle-aged Filipino who had ordered everything on the table watched me proudly as I sampled this and other mystifying foods. Tonight I returned to Krystal Cafe & Pastry Shop, which enjoys the (some might say dubious) distinction of being perhaps the most authentic Philippine restaurant in town to gain a better understanding. Perhaps it should not be surprising that a country whose primary language has one of the more intimidating grammars I’ve seen also has a bewildering sense of taste. 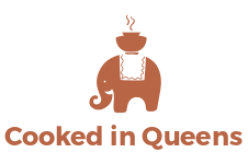 The national cuisine probably also collects elements from the idiosyncratic cuisines of the many local communities of the Philippines, which is spread out over more than 7000 islands. The country has at least eight major ethnolinguistic groups. The Cebuano of Bantayan Island like sun-dried fish “marinated in sea water” (Labtingaw). The Waray have many dishes cooked with coconut milk, including crabs cooked in coconut milk. The Bicolanos supposedly make a spicy dish out of shark and sting ray. This time I decided to try what is sometimes described as a national dish of the Philippines, chicken adobo. 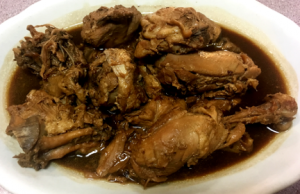 Chicken adobo is chicken marinated and braised in a mixture of vinegar, soy sauce, and garlic. 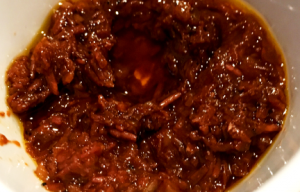 According to the Post, this marinade acts as a preservative, and the meat can be left unrefrigerated for several days after being prepared as adobo. My chicken adobo was soft and falling off the bone, and sweet with the taste of soy sauce. It was served with a heaping plate of steamed rice. This was a dish that required no translation, and I can recommend it to anyone who plans to visit Krystal Cafe. I also ordered one of the dishes the Philippines has imported from its neighbors: egg rolls (lumpiang prito). Very good. 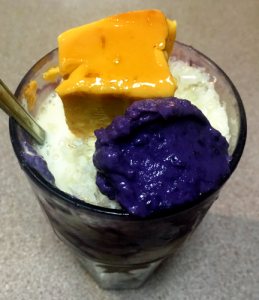 I ended the night with a glass of halo-halo. This is a mildly sweet treat made with shaved ice, milk, sweet beans (such as mung beans) and fruit (such as jackfruit and mango), and, at Krystal Cafe at least, tapioca. I am not inclined to try anything with shaved ice, but this is a wonderful combination—and it is the perfect thing for the coming hot summer nights. The peaks and valleys of the Himalayas have long protected peoples and practices whose origins are murky even in legendary accounts. One such people is the Thakalis of Thak Khola Valley in Mustang. The Thakalis live along what used to be an active trade route between Lhasa and Khatmandu, but have maintained a closed clan system and a peculiar marriage system. Like other peoples in the Tibetan plateau, they practice polyandry, wherein a woman may marry many men. Unlike any other people of the Tibetan plateau that I know of, they only marry outside of their clan (but within one of the four Thakali clans). 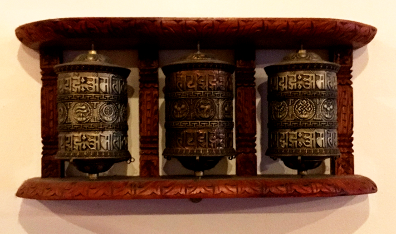 The Thakali people also have a distinct cuisine—influenced by the cuisines of Tibet, India, and Nepal, but containing unique elements—as you can discover for yourself at Mustang Thakali Kitchen. Thakali cuisine is marked by a predominance of buckwheat, probably the cereal best suited to the climate of Mustang. But it is also marked by a more promiscuous mixture of high Himalayan foods—such as blood sausages—and Indian foods, such as dhal. It seems likely that the Thakali, playing hosts to traders from Lhasa and Khatmandu, learned to cater to a variety of tastes and incorporate a variety of foods into their own dishes. 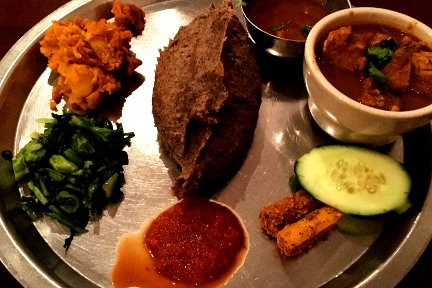 On my first visit to Mustang Thakali Kitchen, I ordered yhoshi. The centerpiece of this dish is a large dollop of mashed buckwheat. It almost has the consistency of raw dough, but the buckwheat is coarser than flour. Arranged around this are several items cooked in masala: masala chicken, masala dhal, masala vegetables. There was a pile of greens I could not identify and a bowl of spices. The waitress instructed me to take balls of buckwheat and dip them into the various other dishes. Later she was genuinely curious to know whether I liked it. These restaurants routinely have sections on the menu devoted to chow mein and Indian dishes for people who are not from the homeland, and she had expressed a little doubt when I ordered yhoshi. “It is like Tibetan tsampa,” I said. Everything on the plate was excellent. 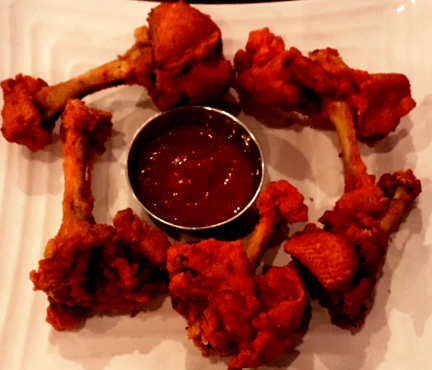 I also ordered “chicken lollipops” as an appetizer. I believe this is a widespread Nepali dish, although I cannot remember the standard name of it. It is a drumstick in which the meat has been pushed to the end of the bone before cooking. 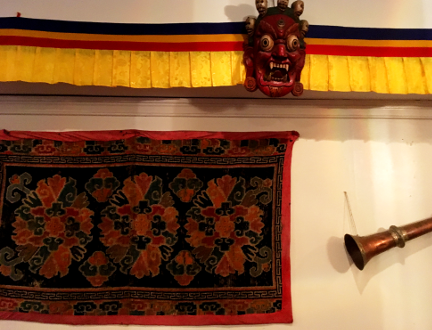 The walls of Mustang Thakali Kitchen display a quite good collection of Himalayan art, including religious masks, prayer wheels, trumpets, and more modern takes on traditional themes. Near the front door is a shrine to Buddha, with a wooden Buddha statue at its apex. In front of the statue are offering bowls and candles. It appeared to be more for use than for show. The people of Mustang have experienced hardships in the past century, as the old trade routes have become obsolete, and the geopolitical maneuverings of China and Khatmandu have upended its political order. It may not be surprising then that the majority of Thakalis have left Thak Khola Valley. Like Newar Basa, Thakali is a threatened language—and very likely the culture as a whole is threatened. It is lucky that we can still experience a little of the culture. You could spend weeks exploring all the shops that hang a shingle on 74th Avenue. But that would be a mistake. You must look behind those shops, where many smaller shops, known by word of mouth only, lie in narrow corridors or down staircases. Lhasa Fast Food is one such shop. To find it, you walk through a doorway between a cell phone store and a hairstylist’s shop, around a stairwell that leads to an Indian clothing shop, and down a hall past an shop selling jewelry and bronze statues of gods. The hallway terminates in a small kitchen under a picture of the Dalai Lama and a red and gold lintel of the kind seen on Tibetan monasteries, with the words “Lhasa Fast Food” painted across the middle. A refrigerator for drinks and a counter-top with a tip jar and a picnic dispenser full of butter tea separates the kitchen from a small dining area. 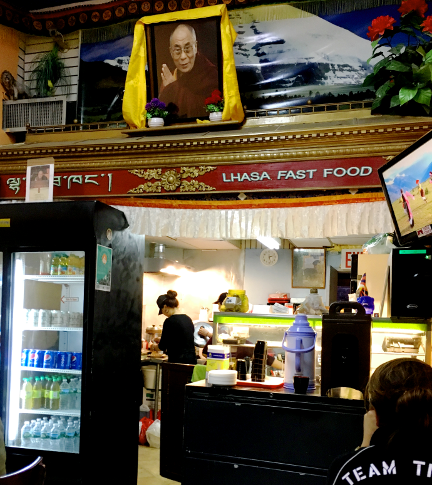 There are only five tables at Lhasa Fast Food, and it seems as though there are always people standing in the hallway waiting to pick up an order or waiting for tables. A large television over the counter streams Tibetan folk music videos, with Tibetans in traditional chupas swinging the long sleeves around in dance. No one watches the television, though: people are here to enjoy a special treat, and they are absorbed in food or conversation. Tibetan dancing of the sort you can see if you stay a while at Lhasa Fast Food. In my view, Lhasa Fast Food is a misleading name. There is nothing very fast about Lhasa Fast Food: everything is made fresh, and when they are busy, and they are always busy, an order can take a while. The first time I went, I ordered beef momos and a tsingmo, and I had plenty of time to watch the cooks—a middle aged man and woman—working at the stove. This is actually worth seeing. 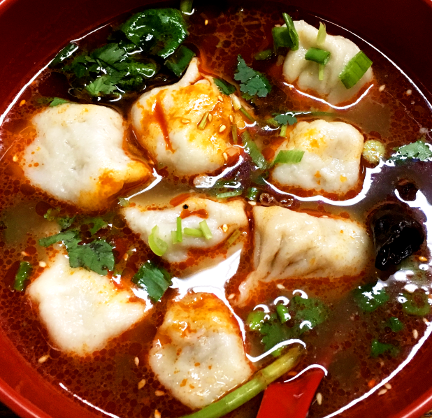 Lhasa Fast Food has become famous for its momos—Anthony Bourdain recently visited and sampled them—and the cooks are always preparing orders for several parties, but all of the cooking is done with a small portable electric burner, an electric soup kettle, and a rice cooker. I believe the cooks could take their kitchen on a camping trip. I believe they could take the entire restaurant on a camping trip. 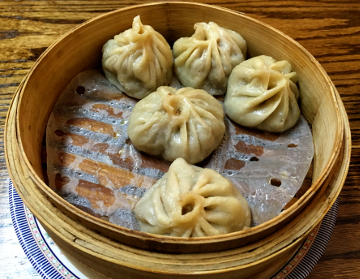 The momos came in a bamboo steamer. They were juicy and piping hot. The meat was chewy, with bits of gristle, and flavored with peppers, chives, and onion. The butter tea did not disappoint. I went again a few days later, and ordered momo in soup. 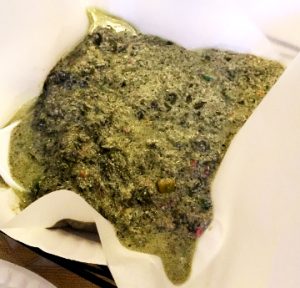 The soup was spicy and delicious, with cellophane noodles, a leafy green of some kind, and wood ear fungus. The momos were much the same, tasty as usual. Update June 7, 2017: I made a third visit. This time I tried the thenthuk, a soup supposedly from Amdo but popular all over Tibet. It shared some elements in common with the momo soup I had a few days before. 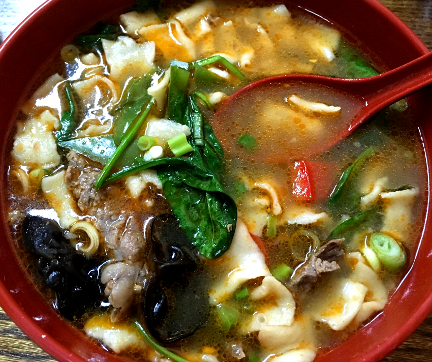 Spinach leaves, boiled beef, hand-pulled noodles, spring onions, and green peppers floated to the top of a mildly spicy broth. Below these were a bed of cellophane noodles. 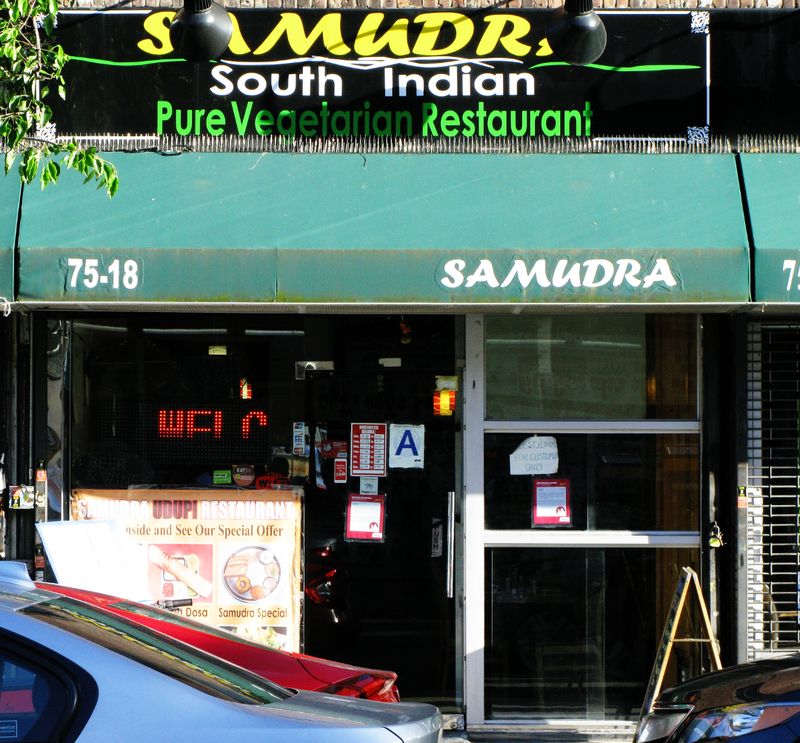 Tucked between a Dunkin Donuts and a pizza shop on 37th Avenue, Samudra is slightly removed from the crowded center of Indian and Himalayan shops around the Roosevelt Avenue subway station. Two blocks south, you can have your hair cut at Punjab Barbers and shop at a Halal grocer, or a Bangladeshi or Indian grocer. But on 37th Avenue, you get your hair cut at Sal’s Barber Shop and buy your groceries at Foodtown. And from the outside, Samudra—with its tiny storefront and generic awning—does not look promising, as if the Dunkin Donuts had decided to try an Indian extension. But the interior surprises: the space is long, with plenty of tables, and the menu is correspondingly long. 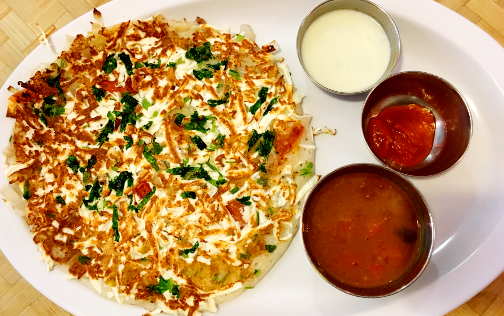 Samudra has an excellent selection of South Indian foods, with over a dozen different dosas. They also have a North Indian menu—although everything is vegetarian. I ordered rasam idli as an appetizer. Idli is a kind of cake made from fermented lentils and rice, similar to dosas but small and thick. 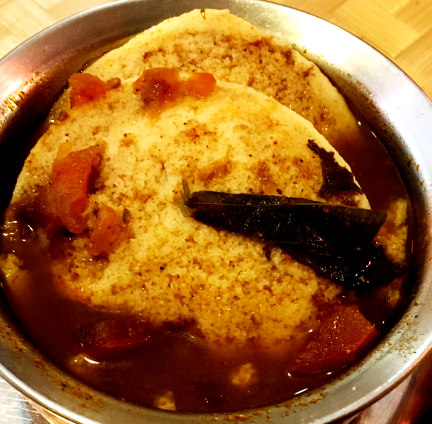 In the dish I ordered, the idli is soaked in a tart soup, rasam, which is made from tamarind with cumin and other spices. The flavor is almost pungent at first, and then the spices begin to cut through the tamarind to give it a more complex flavor. For the main course, I ordered paneer uttapam—a cake made from a similar fermented rice and gram lentil batter, but with potato, onion, chives, and cottage cheese mixed in. The result is a refreshing mix of flavors. It is served with chutney and masala on the side. Samudra means ‘ocean’ in Hindi, and the interior of the restaurant evokes the beaches of Mumbai. The tables are topped with woven bamboo, honey-colored woodwork lines the walls, and a reed awning shades the tables on one side of the room from an imagined sun. Perhaps it is a little kitschy, but it is not the expected statues of Ganesh or pictures of Gandhi.